I LOVE to cook, but I don't claim to be a baker. Of course, I love cookies and cakes, pies and other sinfully rich delights, but just looking at these delicacies can pile on the pounds. However, I will make an exception for a special occasion or request. Yesterday was JP's Birthday, and he asked that I make him a Chocolate Torte! Meanwhile, melt the butter and skim off the foam. Return to heat and melt the chocolates within the butter. ( We went to Whole Foods and purchased bar and chip chocolate in their bakery / coffee bar. I was in search for Callebaut Belgian chocolate, as JP is from Belgium and that's a popular baking choice out there. However, it was unavailable, so we bought a 6 oz bar of dark South American chocolate, and about 6 oz of German milk chipped chocolate. I say experiment. If you love chocolate, you can't go wrong :) Next time, I think I will use more dark chocolate and less milk chocolate, as this particular torte is pretty sweet! Beat the sifted cornstarch slowly into the cooling egg mixture on low speed and until thoroughly blended. Stir the vanilla into the chocolate mixture, and then pour the chocolate mix into the egg mixture and stir by folding until it's uniform in color. Spoon into a 10-inch springform pan that has been greased and floured. Bake at 325 F for 20-25 minutes, until torte slightly pulls away from sides of pan. A knife inserted in center will NOT come out clean, so do not over bake! (I took mine out after 22 minutes. It was rather jiggly in the middle, and after about a minute, it deflated a bit leaving a central depression, perfect for the glaze) Cool in the springform pan, and remove from ring. 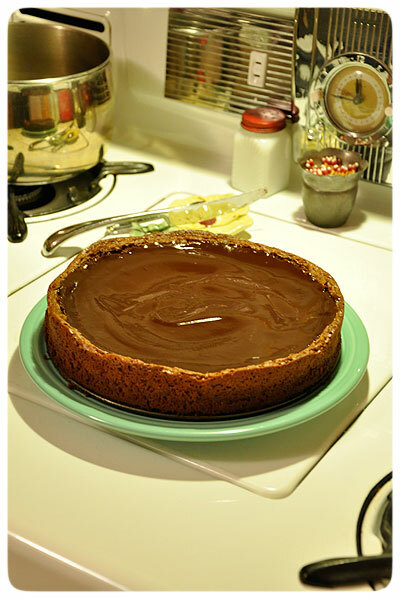 To make the glaze, melt remaining chocolate, butter and cream and spoon over the cooled torte. Refrigerate and chill completely. Every bite is rich, dense and delish! I suggest serving it with raspberries or strawberries and a hot cup of cappuccino!